I’ve been afraid of drawing for as long as I can remember. I don’t recall anyone telling me that I wasn’t good at it (though that may be buried under some dark ocean currents), but I always noticed how little my drawings resembled those done by my friends, for whom perfect likenesses of fruit bowls and tigers seemed as easy as breathing. This didn’t feel good. I honestly think I must have been overwhelmed by trying to take in all the lines and shades and proportions of an object all at the same time. It felt like a language I didn’t speak, something I couldn’t grasp with my hands (incidentally, I still feel the same way about music and math). So I took shortcuts, and I just didn’t draw, for years and years. I took a few classes here and there, but I think I was too intimidated by all the other students, who were very kind to me, but who seemed to produce beautiful drawings effortlessly, while even my most focused attempts resulted in something that did not look at all like I wanted it to. My fear of drawing kept me from painting for most of my life too–if you can’t draw something, how can you paint it? In the past five years or so, I have really embraced so many things that I didn’t think I could do, and it has made my life so much richer. But drawing was the last holdout. In my painting class, we were asked to do a bit of freeform sketching to gather ideas for our paintings. When I heard this instruction, my heart sank. I put it off for days. And then I bought a sketchbook. I found my favorite pencils and erasers. And I started trying to see. I think my only real hindrance is impatience–it just takes time to see the lines and the shading and the size of what you are drawing relative to everything else in the field of view. I find that thought comforting. I am still just getting started, but I wanted to share this little sketch. I went to the zoo in Santa Barbara, which was really lovely, and I was so taken with the elephants. I sat down on a bench and got out my pencils and tried my hardest to see. 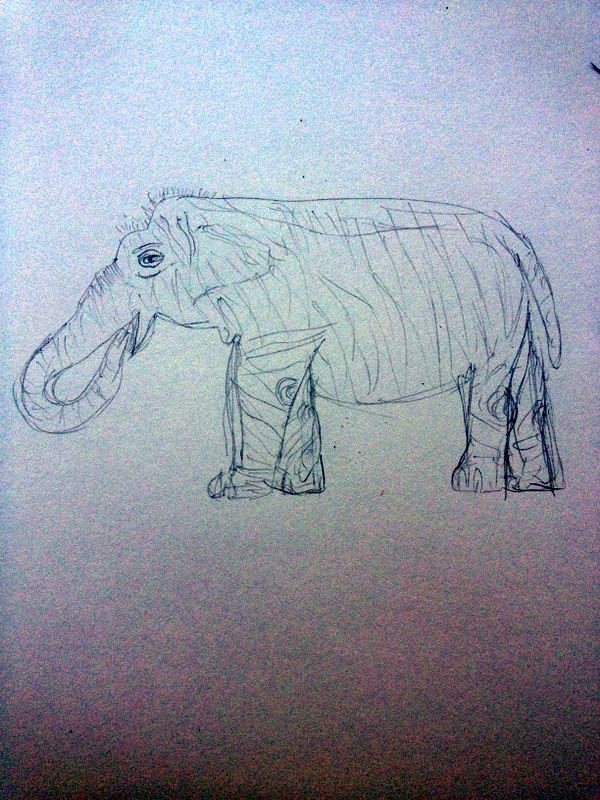 I don’t by any means think this is a masterpiece, but it looks like an elephant, and that is a victory for me. I am especially happy with the eye and the fuzz on top of the head. And maybe those reverse kneecaps. I wonder if I would ever have noticed them otherwise. I am so happy that I somehow worked up the courage to try to record them. « Art From Scrap	» Hello from Santa Fe! In high school I took classes in mechanical and architectural drafting, and I loved it. Trying to understand the spacial relationships of a three dimensional item and getting that successfully transfered onto a two dimensional medium was immensely satisfying. Like you, I find free-form sketching intimidating. It lacks the hard and fast rules of drafting (no straight edges, rulers, and T-squares). I believe you have properly identified that the key is the ‘seeing’, and taking the time to soak in what you are looking at before starting to draw. I may have to give sketching another try. How lovely! I can imagine the difference between the two–I think I tend much more toward hard lines than soft shading, but I am having fun trying to learn a bit more. Eric actually has a great book on drawing that he was thinking about bringing to the farm. Maybe all three of us could try some sketching together. That would be so much fun! So clearly an elephant! Nothing like being handed a drawing by a child and having no idea what it is. Haha, I know! I always hope in those cases that I can get them to tell me all about it! The professor really can’t draw at all. I bet he can if he tries! Yes, I relate to the feelings you so completely expressed. And then something changes and you see lines and shapes. The ability to break things down to their simplest forms changes everything! Congrats on your elephant! I did the same thing with singing when I was little. Someone told me I was bad at singing in second grade and I didn’t sing for about 6 years (even though I loved singing). When my good friend was in second grade at a Catholic school, the nun divided the class into “singers” and “listeners”. My friend was placed in the latter group. Boo! It would have been better if he had at least been given an instrument! I’m so glad to hear that this story has a happy ending! Yes, sing to your heart’s content! I am so sorry you did not think you could draw. It’s such a magical process, turning marks into shapes and ideas. I am so glad you are now trusting yourself to see. Thank you! I think there must be something buried deep in there about drawing…or maybe I just never gave myself time to practice. In any case, I am having so much fun with it now, and am so happy I finally got here! Your elephant is lovely! The knees and eye are my favorite, too. Thank you! And what a lovely idea! I drag my sketchbook around with me all the time now, and I love those little moments of sketching something out. When we were in Santa Barbara, I sketched Eric (unbeknownst to him) while he was working on some difficult data stuff. I showed it to him later, and he told me I got his tight shoulders down perfectly: ha! It is so much fun to explore things like this, like being a kid again. It’s probably the most fun I’ve had as an adult.